There will be plenty of Guinness poured this holiday weekend as revelers go out to celebrate Saint Patrick’s Day. This made me think that it’s a perfect time to dust off this video I recorded several years ago at Mr. Dooley’s in Boston. I created it for the “Drink of the Week” series I produced for the Boston Globe and it’s one of my favorites. Pouring other beers is pretty standard but pouring a Guinness the correct way is an art. Here, Terry shows how it’s done the right way. If you’re out drinking Guinness at the bars this weekend, be sure your bartender knows what he’s doing. Friends don’t let friends pour incorrectly. Thinking about drinking and/or serving something special for New Year’s Eve? 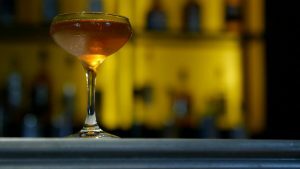 Take a look at these cocktail recipes from bars and restaurants in the Boston area. I shot these videos as part of the Drink of the Week video series I created for the Boston Globe and Boston.com. They are arranged here so that you can quickly scan them and I highlighted (in parentheses, next to each title) the main alcohol used so you can quickly find a vodka, gin, bourbon, tequila, or rum-based concoction. Go ahead: choose your poison wisely. Feeling a little tired from Christmas? Here’s a cocktail to wake you up: The Bohemian. Step 1 Mix the gin, elderflower, grapefruit juice and bitters over ice in a cocktail shaker. Step 2 Shake until blended well and cold. Step 3 Pour into a cocktail glass and garnish with a twist of lemon. 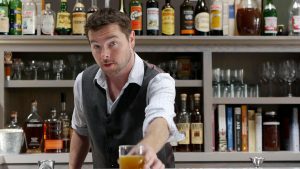 Here’s an easy recipe to make a special drink for New Year’s Eve. All you need is gin and a liqueur called, Pavan, which offers flavors of grapes and orange blossoms. You can also add a little bit of simple syrup and a squirt of lemon to round out the flavors. Step 1 Pour gin and Pavon over ice. The ratio should be 2/3 gin and 1/3 Pavon. Step 2 Add about 1/4 cup of simple syrup and a squirt of lemon juice. Step 3 Garnish with lemon and serve. This tequila cocktail recipe is a little complicated but worth it, if you’re up to the task. It requires one egg white and some Creme de Violette. 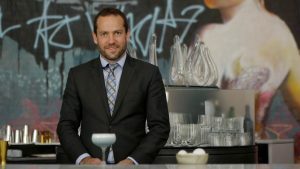 And you have to shake it twice in a cocktail shaker: once without ice to blend in the egg white and once with ice so you can serve it chilled. Step 1 Crack an egg white into a cocktail shaker without ice. Step 2 Next, add the simple syrup, Creme de Violette, fresh lime juice, and tequila. Shake once without ice. Step 3 Add ice to cocktail shaker and shake it a second time. Step 4 Double-strain it into a coupe glass and wait a few seconds for the egg white to settle on top. Step 5 Once the egg white settles on top, put several drops of bitters ontop. Take a toothpick and create a design with the bitters. This drink is all about name dropping. It’s named after the Patriot’s football star Rob Gronkowski and was created in a bar named after a former Red Sox player turned commentator, Jerry Remy. However, that bar is now called Tony C’s, after former Red Sox player Tony Conigliaro. Confused? This vodka drink may help. Grey Goose Cherry Vodka, 1 1/2 oz. Step 1 Put lime quarters in a tall glass. Add Cointreau cherries and muddle it in the glass. Step 2 Add fresh mint, ice, vodka, and shake it up. Step 3 Top it off with ginger beer and serve. This cocktail requires a couple of special ingredients: Pimm’s, which is an English gin-based liqueur with bitter herbs, and Chartreuse, a French liqueur made by monks since the 18th century. Both are mixed with vodka and some cucumber slices. Step 1 Add Pimm’s, vodka, lemon juice, Chartreuse, and two cucumber slices to a cocktail shaker. Step 2 Add ice and shake until well blended and cold. Step 3 Strain into a glass and garnish with the remaining cucumber slice. 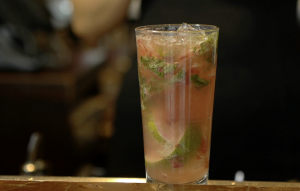 With basil, cocoanut rum, vodka, and cava, this drink from Cuchi Cuchi, a Spanish restaurant in Cambridge, Mass., packs a punch. We’re not even sure if Charo can handle it. Step 1 Put basil, lemongrass, simple syrup and ice in a glass and muddle it good. Step 2 Add rum, vodka and lemon juice. Shake until well blended and cold. Step 3 Pour into a glass and top with some Cava. Garnish with a single basil leaf. If you have a bottle of Chartreuse from making The Farmer’s Son cocktail (above) and you have some coupe glasses from making the Street Art Cocktail (above), you should be all set to make this concoction, named after a subway project in the Boston area. Step 1 Chill a coupe glass by putting ice in it and setting it aside. Step 2 Put sugar cube and bitters in a cocktail pitcher and muddle it into a paste. Step 3 Add the bourbon, brandy, and Chartreuse. Add ice and stir well. Step 4 Discard ice from coupe glass and strain mixture into it.